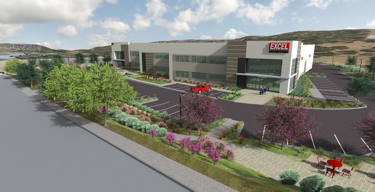 Badiee Development has broken ground on Carlsbad Victory Industrial Park, a 55.6k sf industrial facility in Carlsbad. The project, located at 3248 Lionshead Ave, is slated for completion in earlky summer of 2017. Carlsbad Victory Park has been designed with a contemporary mix of office and warehouse space for two tenants with suites measuring 25.1k sf and 30.4k sf each. The project will feature two upgraded tenant entries, dock-high and grade-level loading, 26-foot clear height, ample power, Automatic Fire Suppression System, mezzanine space, skylights throughout, and a large outdoor patio area. Tucker Hohenstein and Mike Erwin with Colliers International are marketing Carlsbad Victory Park. Colliers International also represented Badiee Development in the purchase of the land parcel for Carlsbad Victory Industrial Park in December 2015. Smith Consulting Architects is the architect and TFW Construction is the general contractor for the development.